ups: Super easy installation; great operation. Here at GF! central, we faced a dilemma. We needed to invest in the ethernet cables that would attach our console test area to our PC gaming and production area. With the current trend of broadband online gaming for consoles, this kind of wire-based proliferation has cluttered up the hallways and open spaces of many homes. Sure, lots of folks have broadband, but how many of them have broadband in the living room? (Mainly, the folks who got broadband to play their game console online.) Most people have installed their broadband service in an office or computer room because that\'s where they use it. As the demand for broadband connection creeps out of the office, you\'re faced with either a wire problem or a pocketbook problem. Both of these things stink, and we were more than happy to accept D-Link\'s offer of a reviewable DWL-810 unit. This handy ethernet to wireless bridge eliminates the need for ethernet cable strung all over your happy home, and it adds even more incentive for broadband users to go wireless. Wireless technology has been around for quite awhile now. It has really gotten popular over the last several years with the introduction of 802.11b technology. This protocol allows a wide variety of devices to communicate through a wireless network, ranging from stand-alone wireless devices to notebook computer network interface cards, to even Apple AirPort hardware and software. 802.11b technology genuinely crosses boundaries ? it is compatible across platforms and through walls. D-Link has taken the best that the 802.11b protocol has to offer and put it into a tiny little box that can hook up any ethernet enabled device to a wireless network. That means no more ethernet cables. But in order to put this technology to work for you, you\'ll need to make sure of a few things. First of all, you need to make the decision between a router and a hub. If you intend to use multiple PCs or your PC and gaming console online at the same time, odds are your broadband provider is going to charge you an arm and a leg for additional IP numbers. So it is generally cheaper and more effective to use a router to enable multiple machines to use the broadband connection at the same time. A router distributes the various requests to access the internet through the single IP your broadband service provider gives you. If you figure that you won\'t be using multiple devices on the internet at the same time, then you can hook up a hub to your cable or DSL modem. This allows you to share the physical connection, but the hub is \"dumb\" and simply pushes through any requests to access the internet. Try using your Xbox and PC at the same time through a hub and chances are your broadband provider will throw a fit. The advantage here is that you can get a five port hub for about $15 at most places, while your typical wired router will cost you about $40. We suggest going for a router. We use a D-Link Di-704, which has been a dream ever since we got it. Routers not only allow you to use multiple devices on the Internet at the same time (very useful when your significant other decides that watching you waste \'mechs online is more boring than browsing Fark.com), but they also typically include some firewall protection, which is an issue anyone stepping up to broadband should be aware of. A hardware firewall saves a bit on your PC performance and it protects every device connected to your home network. At this point, you\'re probably in two camps. Either you already own a cable/DSL router or you don\'t. If you don\'t, we highly recommend investing in the wireless variety of routers. D-Link makes several good ones, and there is no shortage of them on the market. Wireless routers will cost you somewhere in the range of $150 these days, but they will undoubtedly come down in price over the next year or so. Wireless networking is definitely catching on, so hopefully all of this stuff will get a lot cheaper over the coming months, just as wired networking technology has really hit the bottom end of prices. 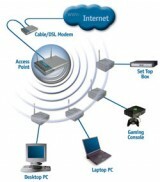 Investing in a good wireless router now will allow you to build your network for years to come. If you already have a router or hub you like, as we did, you might just want to invest in a wireless access point. We used the D-Link DWL-900AP+, which is a screaming fast access point, and very easy to install. A wireless access point allows you to add wireless connectivity to your existing router or hub without paying quite as much. Wireless access points will put you back about $70 these days. Finally, you\'re ready to install either your wireless network interface card (if using a PC or notebook computer) or your DWL 810. The DWL 810 can be plugged into any existing ethernet connection, so that means you could use it on your notebook computer or PC. We tried it ? it works perfectly, and it\'s much less hassle than installing a wireless network interface card. But here at GF! we were much more excited to test it out on our PS2 and Xbox. And we\'re happy to report that it works flawlessly. This is the very first truly plug-and-play device we ever tried. We plugged it into the back of the Xbox and Xbox LIVE took off with no problem. We hosted games for days straight, and no problems. Everything you need to connect the DWL 810 to your console system comes in the package, so installation is literally a matter of plugging it in. The DWL 810 automatically finds the wireless network and creates a connection. It even uses 128 bit Wired Ethernet Protection encryption, ensuring that your network connection remains secure. Interference (the bane of any wireless device) is cut down through the use of 11 channels, switched between intelligently and automatically. The 2.4 GHz wireless technology also gives the DWL 810 a nice range and strong signal power. We noticed no interruptions, interference, or lag using our DWL 810 to play console games online. And that\'s really all there is to be said about the device. If you\'re one of the tech-oriented gamers out there, you can log onto the DWL 810 to configure it using a web browser interface. It is as straightforward and simple as we\'ve come to expect from D-Link, and we\'re very happy using it. Although the DWL 810 comes with a $99 price tag, we think it\'s worth it. A 50 foot ethernet cable will cost you about $30 at a good price, so either way you\'re looking at a decent investment. And although wireless technology may be a bit spendy to set up, it is an investment in the future. Networking in the office and at home are both heading steadily toward the wireless environment, so we don\'t mind spending a bit to be on the leading edge. If you\'re sick of those cables running all over your house, or if you already have a wireless network set up, then make sure you pick up a D-Link DWL 810 for your console gaming pleasure.